Your Google profile represents the real you on Google. Your Google+ Page (also known as Plus Pages) represents your business on Google. 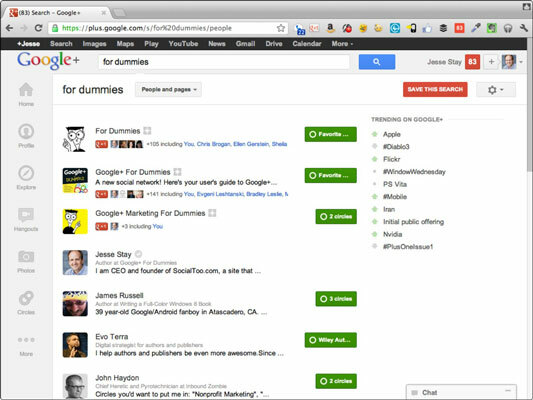 Finding Google+ pages will help you make connections with others. You can add Pages to your circles. You can search for Pages. You can even comment on posts for Pages, just you can with any profile. You can mention Pages just as you do profiles. Right now, this feature just exists on Google+. However, Google could remove the + on this as well and use your business profile across all Google products at some point. Type in your search term into the search bar at the top. If it doesn’t appear in the drop-down menu, press Enter and select People and Pages in the Everything drop-down menu. You might try a search term such as Google+ or For Dummies and see what appears. Mouse over the Follow button. Click the check the box next to the circle you want to add it to. Now that Page will appear in your main news feed every time the Page updates.